Today we will take a look at Iowa’s JC recruiting class, which features one of the top junior college players in the country in the 2015 class. 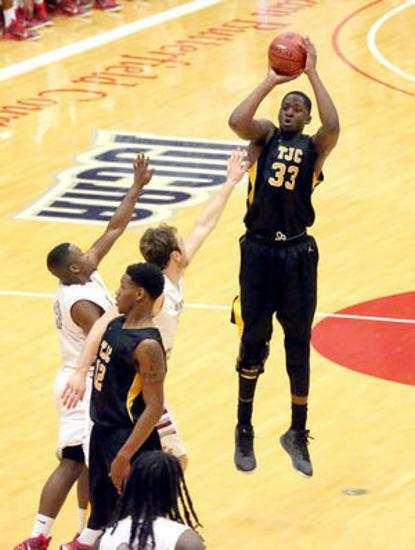 Dale Jones committed to Iowa after completing his sophomore season at Tyler JC. He is currently ranked as the #8 player in our www.JucoRecruiting.com 2015 Top 100 Player Rankings. Our final 2015 rankings will be released in June. What is Iowa getting in Jones? Dale Jones is a 6’8 3 man, who was very impressive when we watched him multiple times throughout the season. Jones is very versatile on the offensive end of has deep range on his jumper. He creates matchup problems for defenders with his unique ability to score in the low and mid post while also being able to sretech the floor and score off the dribble from the perimeter. Jones can create his own shot and has very good footwork on the perimeter. He uses his size well to face up smaller defenders and use a jab series to create space before shooting over smaller defenders. Jones sees the floor very well and is a good passer from the perimeter and from the high-post. He has a smooth and fluid game that should translate very well to the next level. Quality shooters are hard to come by, especially shooters who are 6’8, and Iowa did a very good job of recruiting Jones heavily throughout his sophomore year. On the defensive end, Jones does a solid job of keeping perimeter players in front of him and uses his body well in the low post. He will most likely have to guard threes and stretch four men in the Big 10. Jones does a nice job on the glass on both ends of the floor and has the ability to rebound the ball and initiate the transition break. Jones suffered a knee injury at Tyler, but looked to be almost fully recovered during regional tournament and national tournament play. He still has some issues with lateral mobility on the defensive end when guarding on the perimeter, but his knee did get stronger as the year went on. He should be at full strength by the time the 2015-16 season roles around.